Most of us never consider the acid/alkaline balance of our blood, but a proper pH is a crucial aspect to overall health. Many doctors stress the importance of reducing acidity and increasing alkalinity with an alkaline diet because a balanced pH helps protect us from the inside out. Disease and disorder, they say, cannot take root in a body whose pH is in balance. What is the meaning of “pH balance”? And how do you know if your pH levels are off? 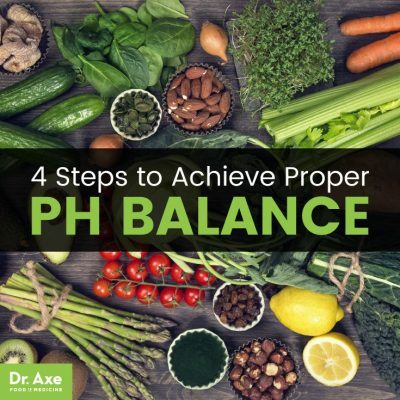 PH balance refers to a proper balance in the body between acidity and alkalinity. Keeping your body at a healthy pH level may help prevent unhealthy microbes and organisms from flourishing, tissues and organs from becoming damaged, minerals from being depleted, and your immune system from being compromised. The very best way to balance your pH is to eat lot of nutrient-dense, alkalizing plant foods and to limit your intake of processed foods. Because so many different factors — gut health, stress, sleep, medications and medical history — also affect your internal pH level, other lifestyle habits can also be helpful for restoring balance. What Is Ph Balance? And Why Is It Key for Good Health? What we call “pH” is short for the “potential of hydrogen,” or the measure of the hydrogen ion concentration of a solution. (2) pH is also a measure of the acidity or alkalinity of our body’s fluids and tissues. It is measured on a pH scale that ranges from 0 to 14. The more acidic a solution is, the lower its pH value. The more alkaline it is, the higher the pH number is. The acidity or alkalinity of different solutions, including human blood but also many others found outside the body (such as the ocean), are indicated on the pH scale. A pH of 7 is considered neutral. “Neutral” means it is equally acidic as alkaline. The healthiest pH level for the human body is one that is slightly more alkaline than acidic. How alkaline should your body be? Optimally, we want to keep our bodies at a pH of 7.365 to 7.45. Your pH level will fluctuate throughout the day depending on many factors (more on these below), but the normal range is between 6 and 7.5. What can cause your pH level to shift towards a more acidic state, thereby causing imbalance? An increase in acid overwhelms the body’s acid-base control systems, causing the blood to become overly acidic. Normally, the kidneys maintain proper balance of pH and electrolyte levels, including calcium, magnesium, potassium and sodium. But when we are exposed to acidic substances, these electrolytes are used to combat acidity. The kidneys start to excrete more minerals out of the body via the urine. High degrees of acidity force our bodies to rob minerals from our bones, cells, organs and tissues. Cells end up lacking enough minerals to properly dispose of waste or oxygenate the body completely. Vitamin absorption is then compromised by mineral loss. Toxins and pathogens can start to accumulate in the body, and this can suppress the immune system. First and foremost, you can reduce your risk for falling out of pH balance by taking a look at how your overall lifestyle and habits might be affecting your nutrient levels, gut and immune system. How do you raise your body’s pH level, in order to make it more slightly more alkaline rather than acidic? Processed meats such as deli meats, cold cuts, hot dogs, salami and cured meats, etc. Processed cereal grains, such as corn flakes, etc. Refined grains including white rice, white bread, pasta, cereals, etc. There are also some otherwise healthy foods that contribute to acidity, but still don’t need to be completed avoided. These foods can still contribute many nutrients to your diet, so continue to eat them in moderation as part of an overall balanced diet. Leafy green vegetables — for example, kale, chard, beet greens, dandelion, spinach, wheat grass, alfalfa grass, etc. Other non-starchy veggies — including mushrooms, tomatoes, avocado, radishes, cucumber, jicama, broccoli, oregano, garlic, ginger, green beans, endive, cabbage, celery, zucchini and asparagus. Raw foods — Uncooked fruits and vegetables are said to be biogenic or “life-giving.” Cooking foods depletes alkalinizing minerals. Increase your intake of raw foods, and try juicing or lightly steaming fruits and vegetables. Ideally try to consume a good portion of your produce raw or only lightly cooked (such as steamed), as raw foods can help supply high levels of alkalizing minerals. Superfoods — for example, maca root, spirulina, sea veggies, bone broth and green powder mixes that contain chlorophyll. Healthy fats — these include coconut oil, MCT oil or virgin olive oil (fats found in wild-caught fish, grass-fed beef, cage-free eggs, nuts, seeds and organic grass-fed butter are also good additions to your diet, even if they aren’t necessarily alkalizing). Starchy plants — like sweet potato, turnips and beets. Plant proteins — such as almonds, navy beans, lima beans and most other beans are good choices. Most fruits — Strangely enough, acidic fruits such as grapefruit and tomatoes don’t create acidity in the body. They do just the opposite and contribute to an alkaline environment. Citrus fruits, dates and raisins are all very alkalizing and may help prevent acidosis. Green drinks (vegetable juices) — Drinks made from green vegetables and grasses in powder form are loaded with alkaline-forming foods and chlorophyll. Chlorophyll is structurally similar to our own blood and alkalizes the blood. Apple cider vinegar — ACV tastes acidic but actually may help restore pH balance. Depending on your current state of health and your goals, you might have even better success with reversing acidity by adhering to an alkalizing, very low-carb ketogenic diet. The Keto diet and its foods are also supportive of pH balance include: healthy fats and oils, all types of leafy greens, powdered greens and drink mixes, and superfoods. Most high protein foods are acid forming, so if you’re eating lots of meat and animal foods, it’s important to balance these with alkalizing plant foods. (7) If you’re following a low carb diet and taking steps to reduce acidity, then you can eat the foods mentioned above and also incorporate some legumes, beans, nuts and lower amounts of starchy plants (since these contain more sugar and carbs). According to the Water Research Center’s website, “The normal range for pH in surface water systems is 6.5 to 8.5 and for groundwater systems is 6 to 8.5.” (8) This means that there is a lot of variation when it comes to pH levels between different sources of water. When water has a pH level less than 6.5, it is considered “acidic, soft, and corrosive,” which means it may potentially leach metal ions such as iron, manganese, copper, lead, and zinc from aquifers, plumbing fixtures, and piping, plus contain certain toxic metals and have a sour taste. The best way to treat the problem of acidic (low pH) water is to use a neutralizer that raises the pH. Water filtered using a reverse osmosis filter is slightly acidic, with a pH level slightly lower than 7. Distilled water and filtered water may not be too alkaline, but as far as pH balance is concerned they are still a better option than tap water or purified bottled water that are more acidic. It’s important to address any underlying health conditions that might be causing you to rely on these drugs regularly. For example, might a lack of sleep, stress, sedentary lifestyle or even allergies be contributing to your health problems? try to determine what types of steps s you can take to naturally reduce your need for medications and drugs. If you live or work in an environment with lots of air pollution take steps to protect yourself as much as possible. You can test your pH by purchasing strips at your local health foods store or pharmacy. You can measure your pH with saliva or urine. Your second urination of the morning will give you the best results. You compare the colors on your test strip to a pH scale chart that comes with your test strip kit. During the day, the best time to test your pH is one hour before a meal and two hours after a meal. If you test with your saliva, you want to try to ideally stay between a pH of 6.8 and 7.3 (remember that optimal pH is about 7.365). As mentioned above, certain foods on the acidic list — like eggs, meat and walnuts — might not be alkalizing, but don’t let that scare you away from eating them. They contain a host of health benefits like antioxidants and omega-3 fatty acids. A healthy balance is what we are shooting for where pH is concerned; it is also possible to become too alkaline, so extremes in either direction are not ideal. Eating a variety of foods, focusing on quality, and addressing other lifestyle concerns are all important for maintaining homeostasis (balance). pH is short for “potential of hydrogen,” which is a measure of the acidity or alkalinity of our body’s fluids and tissues. pH is measured on a pH scale ranging from 0 to 14. The healthiest pH level for the human body is slightly more alkaline than acidic, with an optimal pH of 7.365 (although this fluctuates slightly throughout the day). Causes of acidosis (too much acidity) include a poor diet, poor gut health, certain medications and drugs, kidney or lung disease, and many other unhealthy lifestyle habits. An alkaline diet is one that includes whole foods that have positive effects on pH levels of the blood and urine. An alkaline diet includes lots of fresh vegetables and whole fruits, some raw foods, green juices, beans, nuts and healthy fats. Foods that are acidic and can contribute to pH imbalance include: high-sodium foods, processed grains, too much meat and animal protein, added sugars, and conventional milk. Previous articleFood allergies have tripled in 10 years: Is the Western diet the cause?